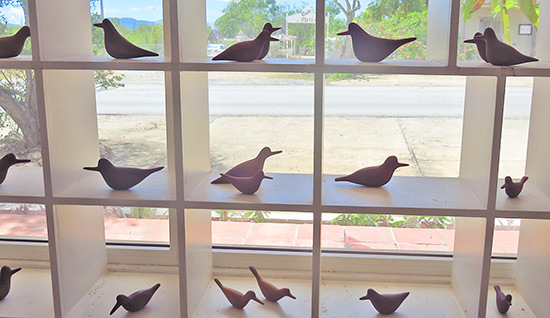 Anguilla has long-had a population of talented local artists, and that population is ever-growing. Similar to other beloved, lesser-known spots around the world (Provincetown, Tofino, etc. 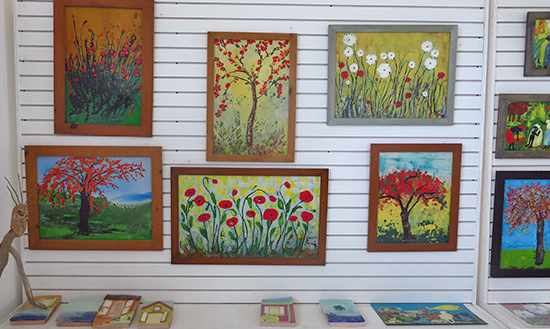 ), many talented ex-pat artists find something special in Anguilla. It's not just the sea scenery and endless tranquility wrapped in blue. It's something in the air, a spirit that touches the soul and inspires. 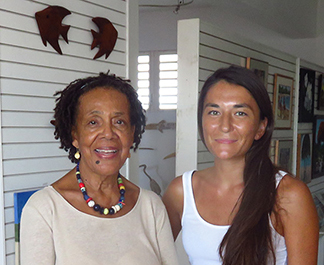 That very spirit has beckoned ex-pat artists to our shores, many who visit once, fall in love and later call Anguilla home. Perhaps the original, who is now more Anguillian than Bajan, is Mr. Courtney Devonish. 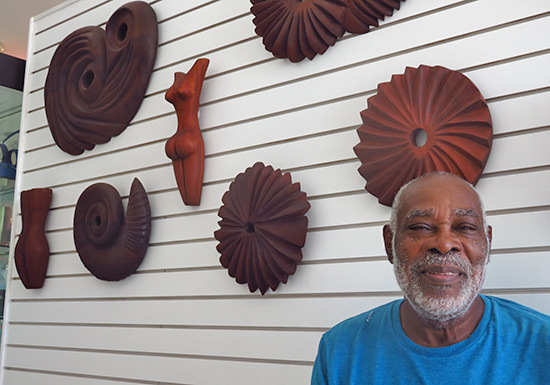 Originally from Barbados, Anguilla has been home to Mr. Courtney Devonish since 1988. Mr. Devonish's creations have been celebrated and showcased worldwide, from London to Guyana, to Cuba and across Canada. His life experiences, too, have taken him to England and Italy, where he studied arts and crafts, and Canada, where he later taught. He is accomplished and experienced to say the least. 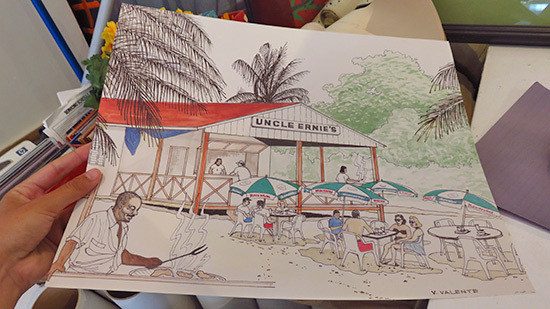 Through all of his travels and experiences, he and his wife Carrolle never felt so at ease than when at home in Anguilla, drinking in its soothing spirit. In talking to Mr. Devonish, one thing quickly becomes clear. His own spirit. When you speak with Mr. Devonish, his eyes sparkle, his smile widens, his mind and heart completely devoted to the conversation. Intelligent, genuine, kind and caring, Mr. Devonish is a warm soul. That personality is deeply conveyed and captured through his rich, signature mahogany sculptures. 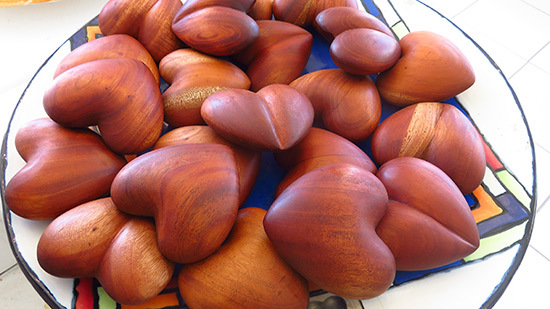 Hand-crafted in his off-site studio, great love and labor goes into creating his fine, smooth sculptures, which not only have been shown in exhibits as far back as in the 1960s, they have even been presented to President Ronald Regan, amongst other heads of states and governments. 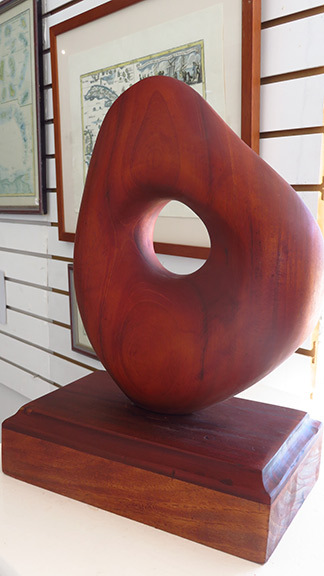 Each sculpture is inspired by a different feeling or moment. 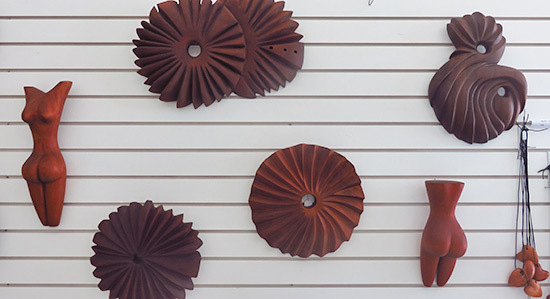 In addition to art pieces, Mr. Devonish hand carves a variety of objects for day-to-day living, bringing warmth and sunshine to the more routine aspects of life. 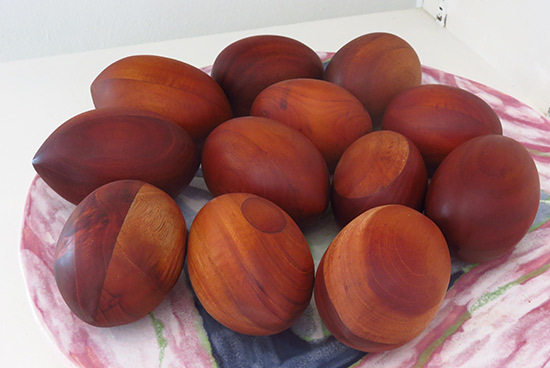 One of his most interesting mahogany carvings is his "Touch Forms." The idea came to him when he was a student with many friends who were trying to quit smoking. One of the hardest parts of the addiction? Coping with idle hands and soothing cravings and tension. And so, "Touch Forms" came to be. 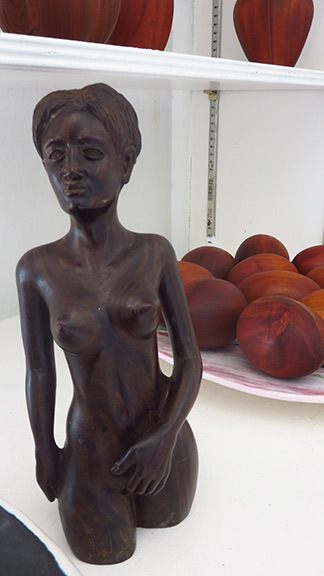 Hand-carved from mahogany, they are just the right weight and come in two sizes. Smooth to the touch, they are designed to be rubbed over and over during moments of stress. Said simply, holding them in the palm of your hand just makes you feel better. 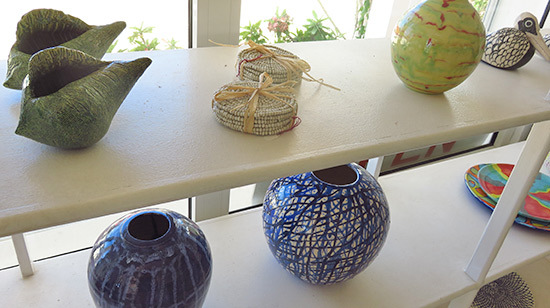 In addition to being a skilled sculptor, Mr. Devonish works with clay and ceramics to create pottery. Playful and colorful, his pottery brightens up a room in a variety of forms, from pelicans and puffer fish, to delicate vases and tableware. 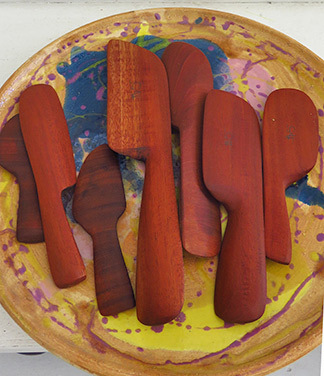 As one might expect, Mr. Devonish's wife, Carrolle Devonish, is equal parts creative and kind. Bead work to adorn the body. 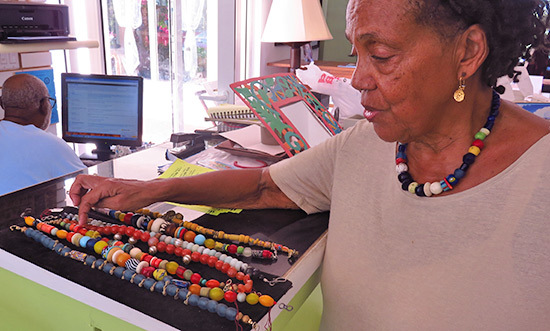 A bead enthusiast who has traveled to and collected beads from all corners of the world, African beads have held a special place in her heart since she visited Kenya in the 90s. 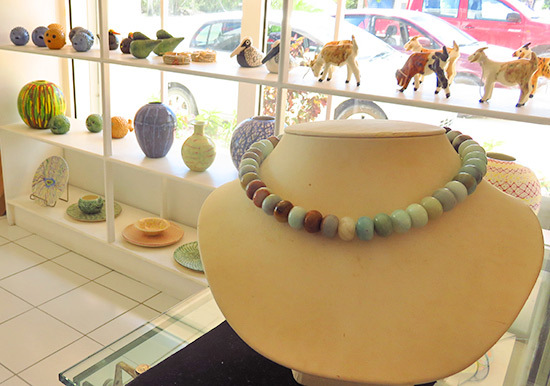 From her vast bead collection, Carrolle creates one of a kind pieces. ... no two creations are the same. Carrolle explained that most of her necklaces are made with glass beads. 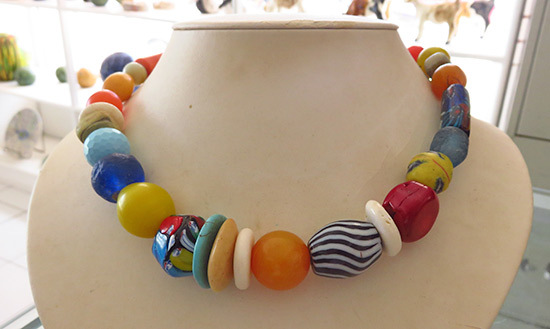 Each necklace is carefully thought through with attention placed on how the beads complement each other. 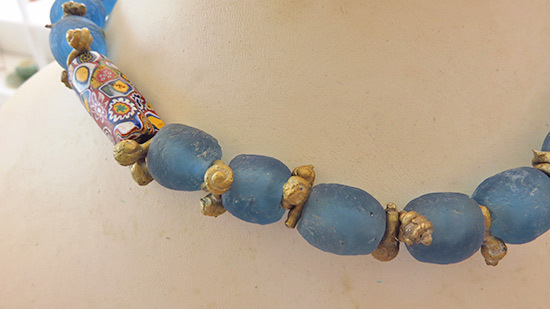 Carrolle explained that these beads are all the way from Ethiopia. Enchanting... the colors reminiscent of the clear water of the Caribbean. 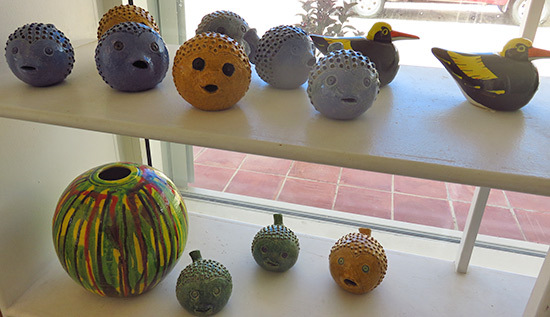 Mr. Devonish's original hand-carved sculptures and hand-made pottery and Carrolle's bead work can be viewed at their gallery, Devonish Art Gallery. 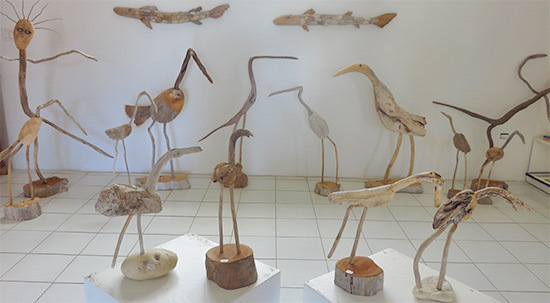 Here, Mr. Devonish also showcases a variety of interesting Anguilla art, a wonderful part of the gallery's culture. 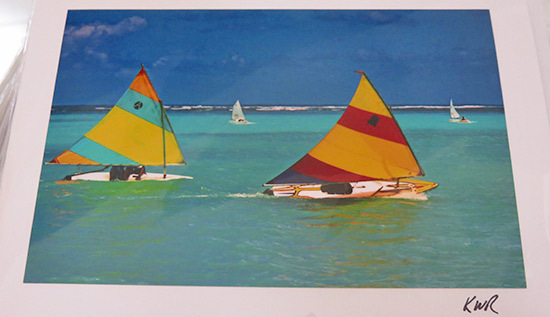 Mr. Devonish uses his own space to celebrate like-minded artists, capturing Anguilla's natural beauty through many different eyes. 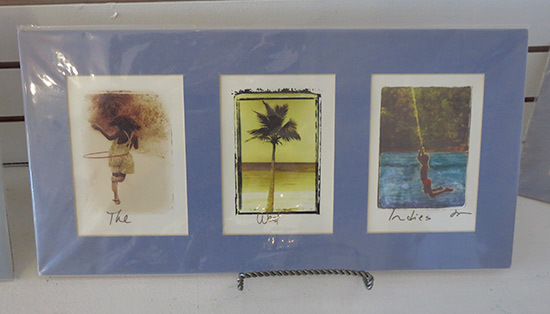 As you move through the gallery, there are plenty of hidden finds to be discovered, including a variety of charming greeting cards. An award winning photographer whose photographs adorn the walls of celebrity homes and politicians' board rooms, Mr. Kirk Russell's fine photography upon greeting cards is noteworthy. 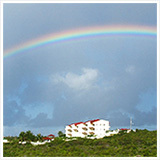 Stunning, quality captures of familiar Anguilla scenes, they are unique to Mr. Devonish's shop. 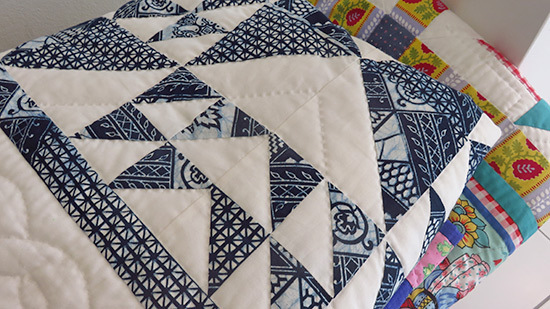 Around another corner of Mr. Devonish's gallery, the sign "In loving memory of Carol Richardson, quilt maker" hangs above an assortment of cozy patchwork quilts. 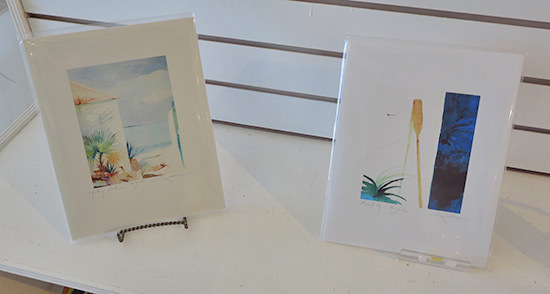 On another shelf in the back of the gallery lies drawings of the Anguilla of yester-year, penned by "V. Valente." 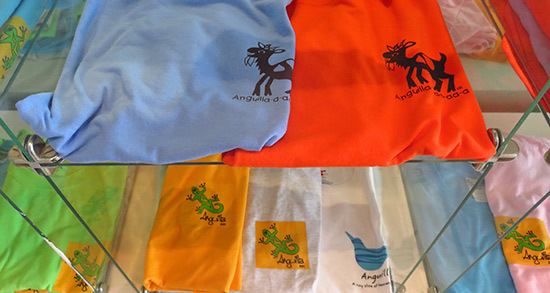 For those seeking more traditional Anguilla souvenirs, a small selection can also be found at Mr. Devonish's gallery. 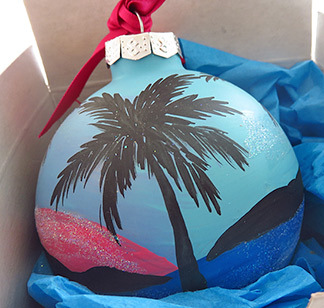 Vibrant, hand-painted Christmas "Anguilla, BWI" Christmas ornaments. Bird, gecko and goat t-shirts. They are not a focus of the gallery, but all are available. 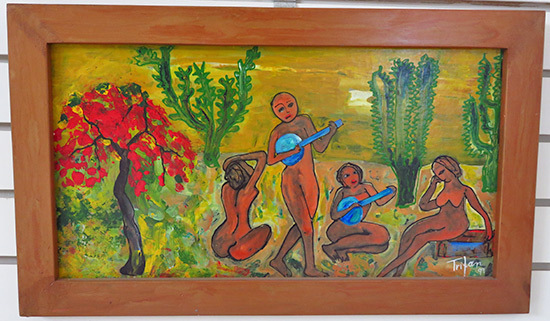 Beyond the scope of Anguilla, Mr. Devonish also encourages burgeoning artists and showcases well-established regional and international artists. 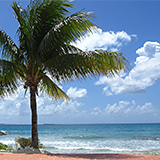 ... or Caribbean feeling in nature, such as the exhibit shown below. Through all of the different expressions shared at Devonish Art Gallery, one commonality holds steady. 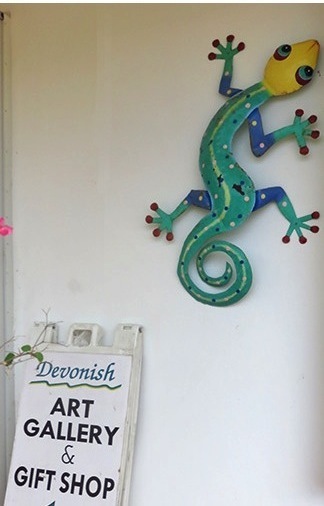 Devonish Art Gallery is a celebration of the arts, and Mr. Devonish is a true original. 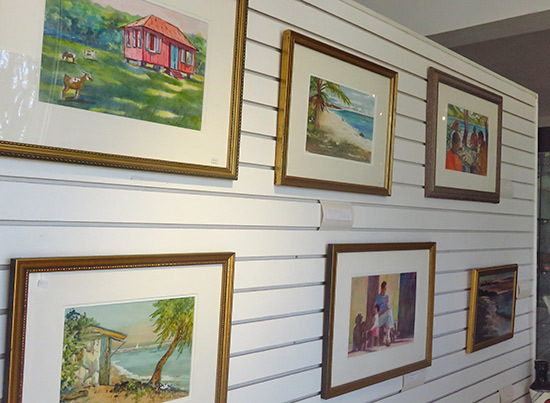 For a slice of Caribbean life and inspiration, visit Mr. Devonish at his gallery, Devonish Art Gallery. Directions: If you are heading west from The Valley, Devonish Art Gallery is located on the main road just before the turn off to the Cove. The gallery is opposite Cafe de Paris. Hours: Daily from 10 or 11am.